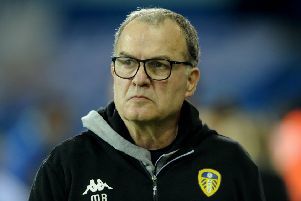 Leeds United were back to winning ways and returned to the top of the Sky Bet Championship as they beat Swansea 2-1 at Elland Road while rivals Norwich were losing at Preston. Marcelo Bielsa’s men were dominant and should have won by a much bigger margin, but had to survive a few nervy moments near the end after Swansea scored from the penalty spot three minutes from time. Referee David Webb, who angered home fans by denying Leeds with three penalty shouts, then gave the visitors five minutes of added time - after the board had gone up for four - but the Whites survived to earn a valuable morale-boosting three points. They took their time to get into the game with last month’s transfer target, Daniel James, showing some good touches on the left wing for Swansea. But gradually United established control, Kemar Roofe hitting a 20-yard shot wide and Pablo Hernandez hitting a poor volley wide after being picked out from a corner. The biggest of their claims for a penalty fell on deaf ears when Cameron Carter-Vickers appeared to handle the ball blocking Patrick Bamford’s attempted through ball right on the edge of the box. But the jeers turned to cheers in the 20th minute when United’s luck turned. After a half-cleared corner fell to Ezgjan Alioski his shot was blocked and the ball fell perfectly for Pontus Jansson to celebrate his birthday with shooting home the opening goal from inside the area. Roofe came close to adding to the lead as he hit a volley just over after playing his part in a good build-up. But the visitors created their best chance as Barrie McKay’s volley across goal somehow evaded the far post and following up teammates. Leeds made it 2-0 on 34 minutes when Luke Ayling picked out the unmarked Alioski with a great crossfield pass and the Macedonian produced a superb angled cross that glanced off Jack Harrison’s to head to end up in the far corner of the net. Into the second half Swansea had the first opportunity with a free-kick on the edge of the box after James made the most of the slightest of touches on him, but Matt Grimes’s shot deflected off the wall and went wide. Leeds soon re-established control, however, and Liam Cooper’s header was easily saved by Mulder while Bamford was wrestled down to the ground in the box with again no penalty forthcoming. Roofe saw a driven cross-shot beaten away by Mulder before a massive scramble in the box saw the visitors somehow survive with Roofe and Mateusz Klich trying to score from close range. In a real hot spell Hernandez sent an angled shot not far over and Bamford forced a save from Mulder with a low shot in the box. Roofe then saw his shot from the edge of the box beaten away by the keeper and when he got on the end of the rebound he went down in the area - once again referee Webb did not think it was a foul and actually gave a free-kick against the United player. Substitute Jamie Shackleton was brought on in midfield and with his first touch went on a surging run before playing Roofe through, but the forward saw his shot go the wrong side of the post. After riding their luck Swansea suddenly woke up in the last 10 minutes and sent a warning shot when Connor Roberts forced a first save of the night from home keeper Kiko Casilla. Grimes was given another free-kick chance only to send his shot straight at Casilla. At the other end Hernandez was close with a strike from range. Out of the blue Swansea were awarded a late penalty as Joel Asoro had his heels clipped by Ayling right on the edge of the area. This time the referee had no doubts about the award of a penalty and Leeds-born Oli McBurnie stepped up to score from the spot. It suddenly went tense and Leeds had more defending to do, but they survived to earn their big three points. Head coach Bielsa was pleased with the victory and could not believe his side did not win by a bigger margin. He said: “I think we deserved to win. “It’s hard to understand we only won by one goal difference because we dominated the game and had many chances to score. “Also we had many options to create chances that we didn’t manage to turn into goals. 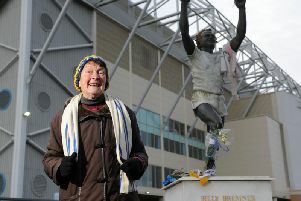 “We’d like to dedicate this win to Jack Clarke because we all feel Jack deserves this win. We hope he will recovered well and we will let him take all the time he needs. Leeds: Casilla, Ayling, Jansson, Cooper, Alioski, Phillips, Hernandez (Davis 90), Klich (Shackleton 78), Roofe, Harrison, Bamford (Roberts 70). Swansea: Mulder, Naughton, Van Der Hoorn, Carter-Vickers, Grimes, Fulton (Asoro 56), Roberts, Byers, Celina, James (Narsingh 68), McKay (McBurnie 61).